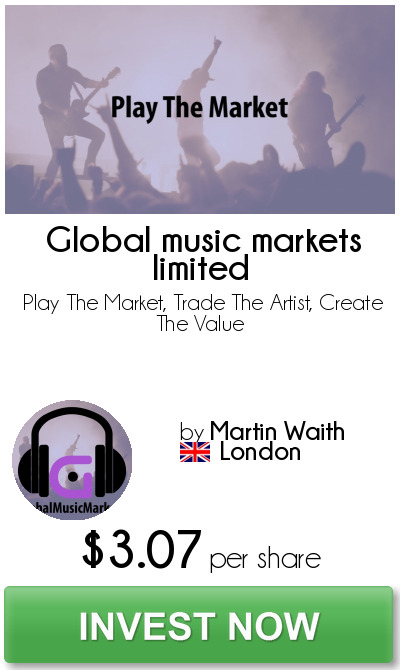 We are Global Music Markets Limited (GMM). GMM is an exciting startup company introducing a new and unique, concept to the consumers of financial services and commercial music. The concept is to provide an API (Application Programming Interface) that will form the basis of connectivity to a new financial trading marketplace focused on and centred on the music industry. This API would be our first and initial offering, however in the future we will be planning how to take this project and expand it potentially to create our own trading platform. To expand the company structure ensuring we are build the company based in a suitable geographical location. We are still in the startup phase. Global Music Markets is not a traditional retail business as we do not provide an item which is directly for sale to the general public. The GMM initial offering is our Application Programming Interface (API). An API is a set of routines, protocols, and tools for building software applications. The API defines functionality and can facilitate integration of new features into existing applications. Specifically the GMM API will contain the functionality to allow access to real-­‐‑time streaming pricing for the new global music marketplace. The GMM business model is based around marketing and distributing the licensing to our API allowing electronic trading providers access. GMM intends for its clients to be the most widely used electronic trading and spread betting platforms initially. As mentioned these platforms will pay a license fee (monthly) which will in turn enable their clients to trade on GMM. This initial offering enables GMM to focus its engagement solely on the platform providers, as opposed to the retail market allowing greater opportunity to further build the business and brand.